From now on ; in our “Articles” section we will introduce Origami Masters and in the future we will illustrate design of those masters. Our first master is Akira Yoshizawa who is the most famous. Akira Yoshizawa (吉澤 章 Yoshizawa Akira), was born in 14/03/1911 in Kaminokawa, Tochigi ,Japan as a child of a farmer family. He knew Origami as a tradition of Japan. When he was 13 years old he moved to Tokyo to work in a factory. When he was working in the factory he made Origami in his spare times. As this was noticed by the factory’s authorities he was moved up to the draftsman from worker status. When he was in his 20s ,he was giving lectures on geometry by using Origami to the new draftsmen in the factory. 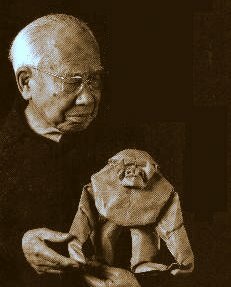 In 1937 he decided to leave the factory and spend all his time making Origami. He was in poverty following twenty years of this decision. He tried to survive his life by selling soy sauce; called “tsukudani” and a kind of soup which is made with sea food from door to door. In 1944 ,for the first time ,his Origami models were included in Isao Honda (本多 功)’s book called Origami Shuko. The year 1951 was the actual beginning of his Origami career as he prepared a 12 Animal Calender for Asahi Graphic Magazine. The book “New Origami Art” (Atarashi Origami Geijutsu) which was released in 1954 was the first book that was completely written by himself. What is most important with this book was ,for the first time illustrative signs were used to explain the Origami diagrams. Today ,those signs are accepted as Origami’s alphabet. After that book was printed poverty years were ended for Yoshizawa. In 1954 he found Tokyo International Origami Center. His first abroad exhibition was in 1955 by the organization of Dutch architect Felix Tikotin at Stedelijk Museum in Amsterdam. After that he had many other exhibitions around the world. In 1956, he got married a lady called Kiyo and after that time she helped him in his Origami career. Akira Yoshizawa is the inventor of the “Wet Origami” technique. In order to have smoother lines he moisturized the paper and when the Origami model was completed he dried it up. 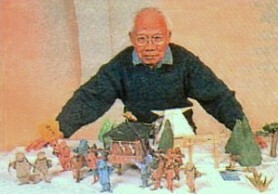 By doing that he was able to make more realistic figures. Yoshizawa was died on his 94th birthday ,in 2005. Today he is approved of being the greatest master of Origami. Among the many inventions of Yoshizawa only a few hundreds of them could be diagrammed. The Origami Master who had 18 released Origami books was honoured with the “Rising Sun Medal (Kyokujitsu shō)” by the Japan emperor Hirohito for introducing Japan culture to the world in 1983. This medal is one of the most honorable medals that a Japanese citizen could have.